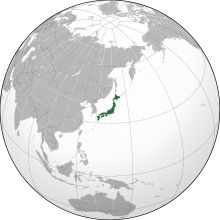 Japan i/dʒəˈpæn/ (Japanese: 日本 Nihon or Nippon; formally 日本国 Nippon-koku or Nihon-koku, literally the State of Japan) is an island nation in East Asia. Located in the Pacific Ocean, it lies to the east of the Sea of Japan, China, North Korea, South Korea and Russia, stretching from the Sea of Okhotsk in the north to the East China Sea and Taiwan in the south. The characters that make up Japan's name mean "sun-origin", which is why Japan is sometimes referred to as the "Land of the Rising Sun". Archaeological research indicates that people lived in Japan as early as the Upper Paleolithic period. The first written mention of Japan is in Chinese history texts from the 1st century AD. Influence from other nations followed by long periods of isolation has characterized Japan's history. In the late 19th and early 20th centuries victory in the First Sino-Japanese War, the Russo-Japanese War, and World War I allowed Japan to expand its empire during a period of increasing militarism. The Second Sino-Japanese War of 1937 expanded into part of World War II, which came to an end in 1945 following the atomic bombings of Hiroshima and Nagasaki. Since adopting its revised constitution in 1947, Japan has maintained a unitary constitutional monarchy with an emperor and an elected parliament called the Diet. A major economic power, Japan has the world's third-largest economy by nominal GDP and fourth-largest economy by purchasing power parity. It is also the world's fourth-largest exporter and fourth-largest importer. Although Japan has officially renounced its right to declare war, it maintains a modern military force in self-defense and peacekeeping roles. After Singapore, Japan has the lowest homicide rate (including attempted homicide) in the world. According to both UN and WHO estimates, Japan has the longest life expectancy of any country in the world. According to the UN, it has the third lowest infant mortality rate.